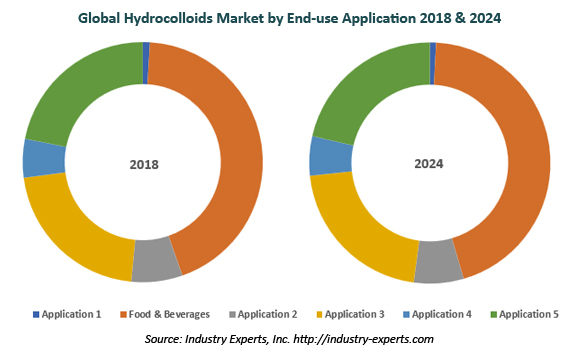 Food & Beverages form the largest application for Hydrocolloids globally, the market for which is estimated at US$5.4 billion (43.7% share) in 2018 and is projected to reach US$7.1 billion by 2024 to reflect the fastest 2018-2024 CAGR of 4.9%. In terms of volume, the global market for Hydrocolloids is expected to reach 2.3 million metric tons in 2019. We have also published the regional market reports with more in-depth country level analysis for Americas, Europe & Middle East and Asia-Pacific. The report reviews, analyses and projects the Hydrocolloids market for global and the regional markets including North America, Europe, Asia-Pacific, South America and Rest of World. Industry Experts, Inc has published exclusive market reports for North America, Europe and Asia-Pacific that provide indepth analysis drilled down by major country in these regions for the period 2015-2024. These regional markets further analyzed in separate reports for 21 independent countries across North America – United States, Canada and Mexico; Europe – France, Germany, Italy, Poland, Russia, Spain and the United Kingdom; Asia-Pacific – China, India, Indonesia, Japan, South Korea, Malaysia and Thailand; South America – Brazil and Argentina; and Rest of World – South Africa and Turkey.